Hand soak, file and cuticle tidy, followed by a moisturising lotion application and polish of your choice. The signature MudPie manicure for exceptional hand care. Nails are filed, cuticles are nourished and hands are softened by exfoliation. Afterwards, the hands are wrapped in a hydrating mask and placed into heated mitts. This is followed by a relaxing hand and arm massage and topped off with a polish of your choice. Designed to brighten and lighten skin tone for a flawless, porcelain finish. Using certified organic ingredients; this treatment will hydrate the skin, restore moisture balance and slow down signs of ageing. Antioxidant-rich white chocolate paraffin wax is applied to the skin to help fight against free radicals, damage from the sun and environmental pollutants. Indulge in our most exclusive manicure. Your hands are soaked in a warm champagne and rose infused bath soak with fresh rose petals. A peony and pink pepper salt scrub is applied to detox the skin and remove dead skin cells, followed by a purifying rose mask with heated mitts. While your hands are warming enjoy a relaxing neck and shoulder massage for ultimate relaxation. Finally, complete this experience with a hand and arm massage using rich shea butter to hydrate and condition the skin. Enjoy all of this with a luxurious cotton candy champagne cocktail. We use Shellac and The Manicure Company gel nail polish. Goes on like a polish and wears like a gel, without damaging your own nails. Nails are buffed, shaped and cuticles are pushed back before application. Shellac/The Manicure Company removal is free if it was originally applied in the salon, when booking any other treatment for the same time/day as removal. We charge €10 for removal alone. Foot soak, file and cuticle tidy, followed by a moisturising lotion application and polish of your choice. Nails are filed, cuticles are nourished and feet are softened by exfoliation. Afterwards, the feet are wrapped in a hydrating mask and placed into heated boots. This is followed by a deeply relaxing leg and foot massage and topped off with a polish of your choice. Indulge in our most exclusive pedicure. Your feet are soaked in a warm champagne and rose infused bath soak with fresh rose petals. A peony and pink pepper salt scrub is applied to detox the skin and remove dead skin cells, followed by a purifying rose mask with heated boots. While your feet are warming enjoy a relaxing neck and shoulder massage for ultimate relaxation. Finally, complete this experience with a leg and foot massage using rich shea butter to hydrate and condition the skin. Enjoy all of this with a luxurious cotton candy champagne cocktail. This pedicure gives exceptional results in just one treatment leaving the roughest, most cracked and callused feet smooth and supple, without the use of blades or rasps. Incorporating a unique alkaline solution, herbal pigment oil and callus creme, the Medi Pedi gently, yet effectively swells, dissolves, then softens any hard skin build up. Includes cuticle tidy and file and polish. A callus peel can be booked as an add-on to any of our pedicures. This twenty minute four step system is designed to treat stubborn skin on the feet and specifically target uncomfortable and unsightly hard skin. A very special treatment for kids (12 and under) with a scented shimmer lotion, polish of their choice and sparkly top coat. A hot chocolate or pink lemonade is served to enjoy with a scrumptious mini cupcake. Please note a patch test is required 24 hours prior to your first waxing treatment at the salon. Please refrain from waxing if you are currently using Glycolic Acid, Retin A or are taking Roaccutane at the time of your appointment, or have been in the last six months. We use Perron Rigot wax. We use Perron Rigot wax. Perron Rigot is a renowned French creator of high quality, low temperature waxes suitable for all techniques and skin types. Only the finest ingredients are used in its formulations. What makes Perron Rigot different from other waxes? Unlike traditional methods of waxing, Perron Rigot wax sticks to the hair rather than the skin, reducing the pain of waxing by 50%! Perron Rigot wax encapsulates the hair, removing it from the root while leaving the skin undamaged. When the integrity of the skin is uncompromised, there is reduced inflammation, redness and downtime for the client; making painful waxing a thing of the past! What makes waxing with Perron Rigot not just hair removal but a complete beauty treatment? Perron Rigot’s pre and post-wax process include Perron Rigot’s Antiseptic Blue Lotion, Pre-Depilatory Jasmin Oil, and After Wax Refreshing Gel. This exclusive system prepares the skin for waxing and leaves it feeling smooth, cool and undamaged. You should allow your hair to grow for ten to fourteen days before waxing. Prior to your first waxing visit with us we require a 24hr patch test to ensure no skin irritation occurs. You can drop in anytime for the patch test. It only takes a minute to perform. Hair needs to be about 1/2 cm long before it can be waxed, particularly if it has been previously shaved, so please allow at least 3 weeks since your last shave and at least 4 weeks between wax treatments. If your hair is very long, please trim it to about 1cm prior to your waxing appointment. 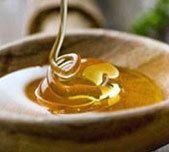 It’s recommended that you gently exfoliate the area to be treated, beginning 2-3 days before your waxing appointment. This removes any dead skin and lifts the hair which makes it easier to remove, and results in a smoother finish. After 2 days very gently exfoliate the area 2-3 times a week and keep the area moisturised. Please note a patch test is required for waxing, tinting, Yumi Lash Lift and HD Brows. Lash extensions are applied to give a more subtle, natural look. We recommend touch-up appointments every two to three weeks. Clients returning for lash refills must return with at least 50% of their set remaining, otherwise this will be classed as a full set and the full set fee will apply. Clients that attempt to return for a lash refill outside of the designated refill time frame will be charged for a full set of eyelash extensions. Also known as the 2D-8D technique; multiple ultra fine extensions are applied to one single natural lash individually while isolating one natural lash at a time, giving a lighter, fluffier and fuller look. If two eyelash extensions are applied to one natural lash it’s described as 2D, if three eyelash extensions are applied to one natural eyelash then it’s described as 3D and so on. Volume lashes are prefect for clients who don't have a lot of lashes, have sparse lashes, bald spots or just want a more dramatic, voluminous look without having to use a thicker lash. Using an express technique individual Nouveau Lashes are applied across the lash line. These are ideal for holidays, special occasions and for people who do not want to wear lashes for longer than two weeks. Lashes should be removed after two weeks. Express lashes removal is free if they were originally applied in the salon, when booking any other treatment for the same time/day as removal. We charge €10 for removal alone. Strip or individual lashes are applied to your natural lashes. Perfect for that one-off special occasion. Yes. we can put you on a regrowth programme that will train your brows into shape over a course of visits. To speed up your regrowth and make your brows look better between visits, there are HD Brows products that will stimulate growth and make your eyebrows appear full and defined. Absolutely. Brow shapes are tailored to the individual. Your brows can be made dark or light, thick or thin, sharp of soft. Yes, a 48 hour tint patch test is required for HD Brows for first time clients or if you have not had a HD Brow treatment with us in the last six months. Patch tests can be posted out to you directly. Can I have HD Brows while pregnant/breastfeeding? As per the manufactures guidelines, HD Brow tints cannot be used on anyone pregnant or breastfeeding. You can still have HD Brow treatments but you will not be tinting during your treatments. No patch test is required in this case. How long do I need to wait following the treatment to resume normal activities? For 48 hours following the treatment we ask that you avoid wearing any eye makeup on your lashes, and avoid water from touching your lashes (swimming, saunas, steam rooms and rigorous workouts; washing your face in a direct stream of water) while your lashes continue to lift and set. After that you can do anything and use what ever you did prior to getting the treatment. Is there any damage to my natural lashes? No, the treatment effects last as long as your natural eyelash cycle. As your eyelashes naturally shed, they will grow back in their natural state. Is there any maintenance involved with a Yumi Lash Lift? How long does a Yumi Lash Lift last? How often should I get the Yumi Lash Lift treatment done? We recommend you book a re-lift every 8-10 weeks or so to maintain your lifted lash look. Not at all. Most clients fall asleep as the treatment is very light. There aren't any unless you are allergic to Ammonia. Most people who are allergic to Ammonia know that they are because they are unable to get their hair coloured. Can I wear mascara after the treatment? Absolutely. However most people choose not to wear mascara as they feel the effect of the Yumi Lashes is enough to pop the eyes. Do not apply waterproof mascara 48 hours prior to your treatment. Is there anyone who can’t get a Yumi Lash Lift treatment? A Yumi Lash Lift cannot be done on anyone pregnant, breastfeeding, allergic to plasters and with any infectious eye conditions. Do Nouveau Lash treatments damage your natural eyelashes? Your technician will consult with you to understand what type of style you are interested in and what look will work best with your natural lashes. The overall look of the lashes can range from very natural to very voluminous. How often will I need to have lash refills? Semi permanent Nouveau Lashes (full or half set) require a refill every 2-3 weeks. The purpose of a lash refill is to maintain the appearance of your lash extensions, by replacing those that have shed. Yes. If you have a tendency to sleep on your stomach, or cover your eyes with a mask, blanket or pillow, it will decrase the life of your lash extensions. If you sleep on your side, you may notice the eye on the side you sleep on will loose a few more lashes than the other. We do ask you to minimise the chance of wetting the extensions for the first 48 hours of wear. After that 48 hour period, the adhesive used to apply your eyelash extensions is secure enough to allow you to get right back to your routine. However, keeping away from extensive contact with steam such as in saunas or certain facials is recommended since it can begin to loosen the bond. Can I use my regular mascara and eye make-up remover with eyelash extensions? You can’t use any oil based or waterproof mascara as they can dissolve the bonding agent and shorten the life of your eyelash extensions. Care also needs to be taken in washing off mascara and eye make-up. Oil free products are available in store for purchase. Can I have Nouveau Lash semi permanent or express lashes while I’m pregnant/breastfeeding? As per manufacturers guidelines, due to changes in hormones neither Nouveau Lash semi permanent or express lashes can be performed while pregnant/breastfeeding. Sienna X Tan is an award winning spray tan which has been specifically tailored to suit a wide variety of skin tones. It is formulated with antioxidants and natural ingredients, such as Q10, babassu and pomegranate seed oil to not only give you the most natural tan, but also ensures your skin is hydrated and moisturised. Kona Tanning Company has appeared in the ‘Victoria’s Secret Fashion Shows’ and ‘Victoria’s Secret Pink Campaigns’ as well as many American TV programmes. Their exclusive formula is odourless, streak-free, and instantly leaves your skin with a radiant island glow. Embrace the tan’s instant confidence lift, as imperfections such as cellulite, varicose veins, bruises, stretch marks, broken blood vessels, tan lines and scars are minimised or even invisible. MudPie is the exclusive supplier of Kona Tan in the UK and Ireland. Preparing well before a spray tan is the most important part of the spray tanning process. If you are going to shave or wax before spray tanning, do it a day before, since you need the pores to close properly after hair removal. If they don’t, excess spray tan solution can lodge in those pores and that will give you a spotty look. The most crucial step – exfoliate. The best time to do it is also a day before your spray tan so that the skin has a chance to recover. Be very, very thorough in places where there is a buildup of dead skin like elbows, knees and ankles. On the day of your spray tan have a shower using a soap or body wash that does not contain a lot of moisturisers. Do not apply anything to your skin like moisturisers, body butters, deodorant or make up – they have a tendency to block spray tanning solution from reaching your skin and you can finish with lighter patches. Some deodorants can also react with a spray tanning solution and turn your underarms green. Remove any jewellery when being sprayed. Dark loose cotton, jersey fabrics and dark underwear without tight waistbands are ideal to wear before and after your spray tan. Some of the guide colour can be easily removed by tight fitting clothing so it is best to keep clothing loose. After your tanning session avoid any activity that would cause sweating, like exercise, cleaning, or showering, as your spray tan is developing during these hours. Contact with water or sweat could result in lines or uneven tanning. For best results leave your tan overnight and shower the following day. When showering, use your palms for lathering in lieu of a loofah or wash cloth. Also, use moisturisers generously as they have been proven to help extend the length of a sunless tan. Be aware that swimming in chlorinated pools dries the skin, which can shorten the life of a sunless tan. Moisturise after swimming to help reverse any dryness, and be careful not to exfoliate the skin when towel-drying, which can cause unintended exfoliation. Healthy, moist skin will retain the results of your sunless tanning session longer. Ask about our tan extending products in store. A classic Swedish massage utilising long, comforting strokes and effleurage movements to deliver complete comfort, reduce stress and return the body to a state of balance. 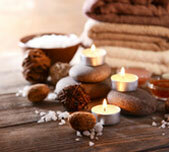 A therapeutic massage is combined with your personal selection of our quality essential oils. This multidimensional approach provides an experience that caters to the individual needs of the body and mind. Stone therapy is a Native American practice that has been used for generations. This relaxing massage uses warm stones to create a sense of balance and calm, as well as providing relief to muscle tension. Customised techniques combined with deep tissue massage to address your specific concerns while promoting health and athletic performance. Indian Head Massage is a relaxing treatment applied to the head, neck, shoulders and arms. The physical benefits are obtained immediately with relaxation of the muscles and easing of tension. It will also relieve mental tiredness, promote clearer thinking, and gives a higher level of alertness and concentration. The ancient healing art of reflexology is a holistic treatment with far-reaching therapeutic benefits. It relaxes, restores and revitalises, while providing a fine-tuning for all of the body’s systems, encouraging the body to function more efficiently. A course of facials are always recommended for optimum results. A hydration and oxygen combination that promotes divine hydration. This luxurious treatment infuses oxygen, plant-derived anti-ageing stem cells, peptides and a high concentration of enzymatic botanicals into the skin leaving it luminous, refreshed and rejuvenated. This is an ideal prep programme immediately before any event. Replenish what your lifestyle diminishes. The facial that does it all – even the most experienced facial enthusiast will be impressed! This cleansing and invigorating vitamin-infused treatment will deliver tightening, lightening, brightening and nourishing hydration to leave you feeling fully refreshed and renewed. An anti-ageing, redness diffusing, active facial. A must-have pre-event hybrid facial adored by brides worldwide. This treatment strikes the ideal balance between a gentle peel and a therapeutic facial, and is designed to really target those pesky wrinkles, elasticity concerns and combat generally lethargic and dull skin. All the latest anti-ageing stem cell technology is used to guarantee immediate and long-lasting results, while the client enjoys being pampered in absolute luxury. The underdog that promises unmissable results. Dubbed nutrition in a bottle, this treatment recharges the youthfulness factor within the skin, and increases internal hydration. A papaya, pineapple, pumpkin and mango-infused blend of organic and medically effective ingredients designed to rebalance tired, stressed and dull-looking skin. This non-chemical peel naturally rebalances regenerates, restores and soothes your skin with organic ingredients. It is literally a green cocktail for sheer skin health. Step two in the fight against acne. A beta and alpha-hydroxy acid cocktail giving antibacterial, anti-inflammatory and antiseptic benefits to fragile compromised and reactive skin. This safe and outstanding resurfacing modality has a dual benefit, reducing and treating all kinds of acne while resurfacing and smoothing the skin after just one treatment. Expect a more even, brighter and healthier reflection after just one session. Peel away the years with instant results in a bottle. This ultra-resurfacing glycolic and retinol treatment exfoliates dead surface skin cells and improves circulation, leaving skin firmer and healthier and visibly reducing the appearance of fine lines, age spots, open pores and rougher, tougher skin. The treatment will truly channel the most active and results-driven ingredients into the lower layers of the skin with a view to measurable and long-term addictive results. Bye-bye age spots to reveal a lighter, brighter you. Balance your complexion with this ultra-lightening treatment that gently blends kojic acid and a cocktail of lightening and brightening agents to reduce sun spots, brown spots and the redness caused by rosacea and acne scarring. The result is silky smooth and supple skin with a noticeable healthy glow. Suited to hand and décolletage areas too. The advanced technology used in this solution breaks down the fat cells resulting in reduction of unwanted fat from those difficult areas on the body while also reducing the appearance of cellulite. The amount of fat reduction varies depending on your build, but many people may reduce by at least one whole size after the first treatment. A course of treatments is recommended for optimal results. Our signature chocolate themed body treatment featuring a heavenly scented sweet orange, vanilla and chocolate salt scrub to increase circulation and improve skin tone. The body exfoliation is followed by a light cleansing shower and a relaxing application of honey gel with vanilla to moisturise and soothe the skin. Enjoy a collection of treatments that evoke the mystique of the Orient. Your journey begins with a welcome ritual followed by a lime and lemongrass salt scrub to purify and exfoliate the skin. Revitalise and enliven your senses with an exquisitely scented full body relaxation massage. A calming yet energising scalp massage with oriental aromas completes your ‘Taste of the Orient’ experience. MiniMi Body Wrap is a painless, effortless process that has the power to remove 8 inches in one treatment. How long does it take and when can I see results? MiniMi Body Wrap is so powerful that a 60 minute session can shrink waistlines by up to 2 inches. The amount of fat reduction varies depending on your build, but many people may reduce by a least one whole size after the first treatment. Immediate results can be seen. After 3 days, you will see the maximum effect. There is a slight increase in urination for 1 to 2 days after the treatment. MiniMi is an excellent jump start to a new and slimmer you. For the fat to come back, new fat cells have to form which would happen if a person continued to eat excess calories. Combine MiniMi with exercise and healthy eating for optimum results. It depends. Most clients require maintenance treatments once or twice a year after the initial course of six treatments. Just as an athlete continues to work out; once a desired fitness level has been achieved, you want too be sure that the fat which is removed stays away for good and your body remains toned and firmed. Please consult your doctor before having any beauty treatments while pregnant/breastfeeding. Medi Pedi, Callus Peel, HD Brow Tint, Nouveau Lash Eyelash Extensions, Yumi Lashes, MiniMi Body Wrap, All Massage, Reflexology and Body Treatments (except pregnancy treatments), Microneedling, Image Skincare – Be Clear Purifying Facial, Signature Lift, Acne Lift, Wrinkle Lift. Our signature pregnancy treatment. Enjoy a neck and shoulder massage with sweet mandarin oil followed by a mini facial to cleanse, tone and moisturise the skin. The lower legs and feet are treated to an exfoliation to improve circulation and reduce any swelling, heaviness and other discomforts often associated with pregnancy. Whilst the legs are wrapped in a cocoon of luxurious oils , a relaxing scalp massage is performed to melt you away in the moment. The gentle scent of neroli oil used throughout the treatment invokes feelings of joy, uplifting the mood whilst making you feel relaxed. (Only recommended after 13 weeks of pregnancy). A relaxing and rejuvenating leg and foot treatment to relieve tired feet. Feet are soaked in a blended oil of sweet almond, rose, mandarin, ho wood and bitter orange. A gentle olive stone scrub is applied to legs and feet for exfoliation. Nails are filed, shaped and cuticles are nourished. This is followed by a deeply relaxing leg and foot massage and topped off with a polish of your choice. (Only recommended after 13 weeks of pregnancy). Most of our facial and massage treatments are suitable for both our male and female clients. Please note a patch test is required 24 hours prior to your first waxing treatment at the salon. Our Men’s Express Pedicure is a great treatment for those men in a hurry! This pedicure consists of a foot soak, cut and file, cuticle tidy, foot massage and nail buff.